This constitutes the first time that China tested one of its recently acquired S-400 air defense systems. 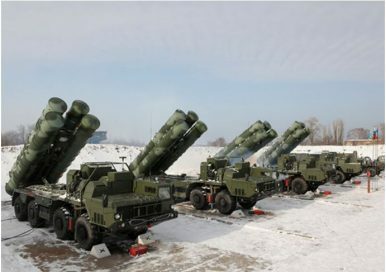 The People’s Liberation Army’s Rocket Force (PLARF) has conducted its first live fire drill of its newly acquired first regimental set of Russian-made S-400 Triumf long-range interceptor-based air defense systems (NATO reporting name: SA-21 Growler), according to Russian media reports. The missile most likely used in the test is the 48N6DM/48N6E3, an upgraded variant of the 48N6E2. The 48N6DM/48N6E3 can reportedly reach top speeds of 4,800 meters per second, which is the same target velocity named in the Russian media report. The missile, fitted with a solid fuel engine, a semi-active homing head, and capable of resisting intense clutter and jamming, is intended to engage intermediate-range ballistic missiles. Notably, the test has so far not been publicly confirmed by the PLARF or other Chinese government entities. In July, Russian media reports indicated that the first test of the S-400 would take place within days. China will reportedly receive a total of two S-400 regiments for an estimated $3 billion with the second regimental set expected to be delivered by the end of 2018. China was the first international customer to place an order for the Russian-made S-400 air defense system in 2014. The U.S. imposed sanctions this September on the People’s Liberation Army’s (PLA) Equipment Development Department (EDD) for the procurement of S-400 air defense systems and Sukhoi Su-35S (NATO reporting name: Flanker-E) fighters.